It’s unsurprising that we have been witnessing increased propane usage across Ontario; being flexible, efficient and environmentally friendly, propane provides for a clean substitute and an economical step towards cleaner air. Accompanying its rise in usage and popularity, have been the questions regarding service, availability, and price. At Fuels Inc., we understand that the answer is highly dependent on the multiple factors that affect each prospective propane user differently and we will compare the two options in terms of flexibility, upkeep and cost in order to provide some insight for individuals faced with this purchasing decision. Arguably the most compelling reason for purchasing rather than leasing a propane tank is due to the flexibility in selecting your own fuel supplier. Purchasing a propane tank empowers you with the ability to select among the different propane suppliers in Ontario and purchase propane that most closely resembles its true market value. Leasing a propane tank will heavily limit your options, and restrict you to purchasing your propane from the lessor. A noticeable mark-up on the price of propane is accompanied with this condition, as this now becomes the supplier’s primary source of revenue.With a high variance in prices being quoted by different propane suppliers in Ontario, it may seem counterintuitive to enter in to a long-term commitment and restrict the purchasing flexibility provided by owning. Falling out of favour with your current propane supplier can be problematic when leasing, and there are likely only two solutions: coordinating a transfer of ownership between your new and old supplier or purchasing the propane tank. These options are not always available, and at the very least can be time consuming; especially if your tank is located underground. Although propane is a natural product which does not degrade, due consideration needs to be given regarding the ongoing maintenance of the propane tank. 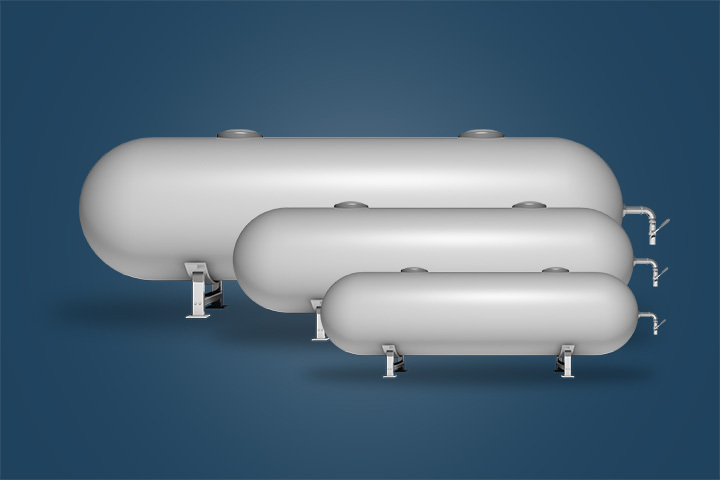 While it is common for propane tanks to last from 30 to 40 years, steps should be taken to maintain the structural and functional integrity of the tank. This is especially important if the tank is stored underground and susceptible to corrosion; which can cause leaks that may not be visible. While leasing a tank delegates this responsibility to the lessor, there are multiple ways in which propane tank owners can reduce the hassle associated with the maintenance of their tank. Checking for rust, leaks and safety controls can seem daunting, but purchasers can have confidence in the numerous experts and qualified technicians which can assist them. This includes established equipment retailers like Fuels, which can provide expertise and a sound support system to their customers. Propane tanks can also be insured, providing purchasers with a financial guarantee and protection against many perils, including fire and collision. Additionally, warranty on the tank, parts and labour can often be negotiated prior to the purchase, alleviating many of the costs associated with maintenance and providing propane tank purchasers with the peace of mind that is regularly afforded under a lease agreement. Saving money on living expenses has always been top of mind for Ontarians; carefully reviewing expenses, and making informed, calculated purchasing decisions can be just one of many ways in which we can all cut down our monthly overhead. While upfront costs are important to consider, we mentioned that purchasing a fuel tank provides you with the choice and flexibility to select your own fuel provider. This can often result in savings that dwarf the initial capital outlay. Even what may seem like a small price per litre discount can result in significant long-term savings, especially for propane users with a high monthly consumption. Uncertainty regarding future market movements and conditions alone often justifies the tank’s purchase; providing you with multiple options if prices are high, and not restricting your price quote to a sole supplier. For those who prefer the monthly payment structure of a lease agreement, they can opt for a financing option, given that their equipment vendor can provide one. The purchase price of a propane tank will also generally include the piping from the tank to the house, along with regulators, fittings, gas and other parts associated with installation; it is also customary for most tank vendors to fill the tank with propane upon installation. And although it may seem insignificant, when selling your home the propane tank will be included in the sale, alleviating the hassle for the next owner and providing a slight boost in your property’s value. There are benefits to both, and while a propane user’s first thought may be to lease their equipment, we have presented circumstances which should least of all be given some serious thought and consideration. Understanding the difficulty of selecting the appropriate option in confidence, Fuels is devoted to providing answers to your questions, and helping you select the right propane and equipment option in the greater Hamilton and Toronto region.